St. Helena, Calif. – As the official BBQ and grilling season kicks off, Sutter Home Family Vineyards announces that Harrison Wheeler from Boynton Beach, Florida was crowned the $25,000 grand prize winner at last week’s Sutter Home Build a Better Burger® Cook Off in St. Helena, California with his Heart & Seoul of Korea Burger. On May 14, 2015, Sutter Home’s rock-star panel of judges were won over with the flavorful Heart & Seoul of Korea Burger topped with a peanut basil slaw and gochujang mayonnaise. Laura Werlin, Build a Better Burger Emcee, noted after sampling the burger during judging, “Now THIS, I want to order in a restaurant.” The judges agreed. Cristen Clark commented on the unusual ingredient, “Who would have thought Spam would be good in a burger – but just the right amount of texture and salt to complete the burger. It paired perfectly with the deep dark Sutter Home Zinfandel.” Chef Rusty Hamlin from Louisiana was a fan of the spice, noting, “Of all the burgers this one had the most flavor – goes straight to my roots of liking that heat! The flavor lingered until the next burger came out.” Tracy Benjamin said she “loved the crunch of the peanuts.” Celebrity Chef Eric Greenspan tasted the Heart & Seoul of Korea burger, which was next to last, and noted, “The next burger better be dope – or we have a winner.” He was right. Eric Greenspan: A recognized chef and owner of 3 top LA Restaurants who has competed on Celebrity Cutthroat Kitchen and Iron Chef America. Cristen Clark: Last year’s Sutter Home Build a Better Burger® Recipe Contest Best Alternative Burger Winner with the $15,000 Sour Apple Pork Burger. Dr. Sharon Ufberg: A lifestyle journalist who writes for various print and online publications about women, wellness, music and wine. Tracy Benjamin: Founder of the fun and colorful blog, Shutterbean. This year’s panel of judges was moderated by Laura Werlin, one of the country’s foremost authorities on cheese. She is the award-winning author of six books on the subject, is a sought-after speaker and spokesperson for consumer and trade organizations, and is a frequent television and radio guest. With the close of the 2014 contest, casual cooks around the nation have the opportunity to enter the 2015 Sutter Home Build a Better Burger® Recipe Contest, which opened on March 30th, 2015 and will run through September 8th, 2015. Prizes for the 2015 contest includes a $25,000 grand prize, $5,000 for the winner of the People’s Choice Award and $1,000 towards the purchase of Weber products. Consumers can also participate in a Build a Better Burger® text-to-win sweepstakes for the chance to win $25 grocery gift cards. Visit www.sutterhome.com for more information. Celebrating its 25th anniversary this year, the Sutter Home Build a Better Burger® Recipe Contest has invited cooks from around the country to submit their original creative, flavorful burger recipes for a chance to win. The 2015 recipe contest is now open for submissions. Recipes can be entered at www.sutterhome.com. Over the years, the popular recipe contest has collected thousands of mouth-watering burger recipes, allowing Sutter Home to create the BurgerBase®, the world’s largest collection of burger recipes. The BurgerBase® also serves as inspiration for contestants, as judges look for original and inspired recipes that are packed with flavor. In 1990, Sutter Home uncorked the wine industry’s first major recipe contest: Sutter Home Build a Better Burger® Recipe Contest. 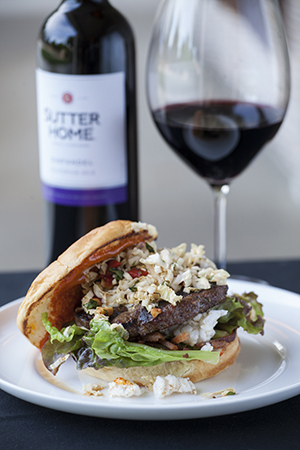 By pairing one of America’s favorite wines with America’s favorite food—the burger—Sutter Home helps to demystify the challenge of pairing wine with food and encourages everyday cooks to create their own recipes and pairings. Since then, Sutter Home has awarded more than $1.3MM in prizes to home cooks across the U.S.
Sponsors of the 2015 Sutter Home Build a Better Burger® Recipe Contest, include Dole, PopChips, KC Masterpiece, Alexia, and The Pork Board, KitchenAid and Weber-Stephen Products LLC. When the Trinchero family bought the Sutter Home Winery in 1948, they had a vision, a passion, and an insight into consumer tastes. In the early 1970s, Sutter Home started a trend when the company created White Zinfandel, introducing a new, sweeter flavor profile and changed the way Americans enjoyed wine by offering high-quality varietals at an affordable price. By the 1980s and 1990s, Sutter Home became a household name and the second largest independent family-run winery in the United States. In 2005, the winery was the first to produce the groundbreaking single-serve, 187ml in light-weight plastic bottles, and was one of the first wineries to produce Moscato over 60 years ago. For more information visit www.SutterHome.com.